Storing power produced by renewable sources. A technology that offers an extensive life cycle with regard to the number of cycles and delivers a more thorough discharge. The system stands out thanks to the resilience of its design and can be adapted to applications requiring high electricity storage capabilities. 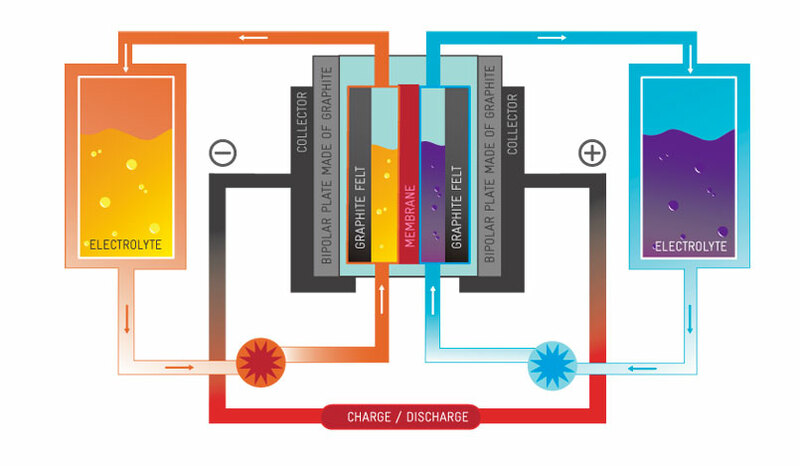 IK4-TEKNIKER and a firm called ZIGOR have developed a first generation of medium power redox flow batteries with in-house know-how that can be applied to the integration of renewables. Efficiency: Optimization of operating strategies to maximise efficiency and costs per kWh kWh. Reliability: Design and development focused on critical components such as frames so that assemblage will provide a fully sealed unit based on a modular concept of construction to simplify maintenance. Scalability: A modular design to enable straightforward scaling on stacks featuring different power ratings.